I’ve found myself with some extra scrappy time this month. I also had a bunch of awesome leftovers from one of my Inspiration Unlimited project kits that I couldn’t wait to play with. Amazingly enough the papers in the pack fit the ScrapMuch? colour challenge perfectly. Even after creating the Inspiration Unlimited project and this layout I still have a ton of leftover product. I know I know, so much build-up right? The papers are all Fancy Pants Designs True Friend collection. 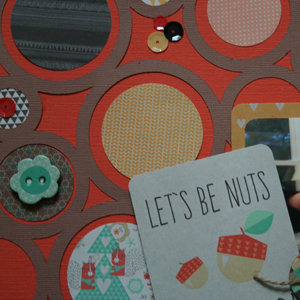 When I get my Inspiration Unlimited post done, (I’m waiting to finish a few of the projects before I blog it) I’ll share the super cute project we made with this kit. Mr & Mrs Fancy Pants (aka Jodi and Jared) were super sweet too! Really great company, really great products! 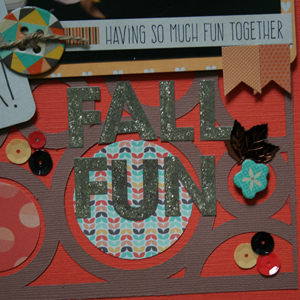 Supplies used: Cardstock – Stampin’ UP!, Bazzill Basics; Die cut machine and shape – Silhouette Cameo; Punches – EK Success, Marvy Uchida, Carl; Sequins – Fancy Pants Designs, Teresa Collins Designs, Lawn Fawn; Chipboard Embellishments – Fancy Pants Designs; Letter Stickers – Fancy Pants Designs; Stickles – Ranger; Jute – Stash; Card, Stickers, Tag – Fancy Pants Designs. This paper line is so much fun! My Cameo decided to have a bit of a fit when it was cutting the bubble placemat, hence the less than clean cut. I think/hope I got it fixed but I was having a mini panic attack wondering what I was going to do if my Silhouette was broken! To play along, all you have to do is create a new paper crafted project, of any type, that uses at least 4 of the colours from the colour board and post it on your blog or any other online forum (ie. your Flickr Account) that you can link us up to, by our deadline. Then link it using the Inlinkz tool in our sidebar. One lucky participant, drawn randomly, will be winning a prize!! It doesn’t get much better than that! Everyone is welcome to play, though there may be some shipping charges to our international winners. The deadline for linking to this challenge is October 29th 2014 at midnight. So if you want to play along and possibly win a prize, you still have time! 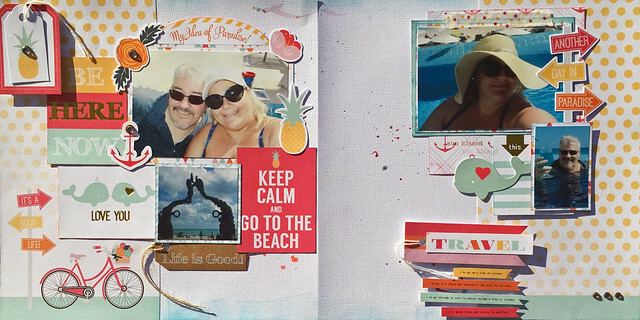 I hope this fun whimsy layout inspired you to create one of your own!